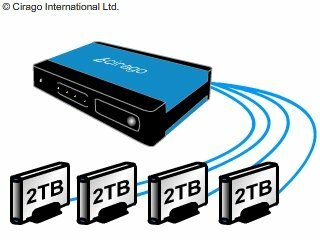 The Cirago Network USB Storage Link is simply designed to do one thing and that is to connect other NAS devices to your network. The main features of the Cirago are its 4 USB ports to be used as you see fit. We attached a few 1 and 2 TB external hard drives to the USB ports and after hooking the Cirago up to our router and getting it on the network, we could instantly access and write to the drives on the network just as if the hard drives were installed within a regular NAS. The freedom and flexibility of 4 USB ports allows for things like printers and other USB devices to be accessed over the network as well, not just extra hard drive space. We usually cover a lot of products that have built in bittorrent clients. What makes this one a little more interesting is that after uploading your torrent file to the Cirago over the network, you can then specify which USB device you’d like to download the files to. Then, when you’re ready to leave in the morning, you can grab your USB storage and throw it in your bag with the files ready to go on it. Regular NAS devices limit you to internal hard drives for downloading .And in some cases, external hard drives can only be accessed in a read-only mode unless reformatted and configured differently. After you burn through the 4 USB ports available to you on the Cirago, the option to use one of those USB ports to plug in a USB port expander to add even more spaces to your device is also an option. Functionality is sometimes limited when you do this, but who can complain with an almost unlimited number of USB ports conceivably available over the network? Just when you thought the Mac and PC war was over, the Cirago tosses in its hat into the debate and reveals its shortfalls. For some reason, a lot of devices just don’t play nice on one side of the fence or the other. In the case of the Cirago, it’s tossed its chips on the Windows side of the argument. Mac users report problems with automatically recognizing this device over their networks and not being able to see some USB hard drives that are attached. We’re not sure what causes this issue, but depending on the problems you run into, you may be able to find a solution online. Overall, the Cirago is a great idea that simply lacks 100% stability with Macs. The ability to take away fully fledged NAS devices from a desk space is a godsend as many of you, like us, struggle to find a place to put our coffee in the morning, let alone a whole other computer. If you want a small and discreet way to connect USB drives to the network, this is it.